The MultiSelectionBox displays a ( scrollable ) list of items from which any number (even nothing!) can be selected. Use the MultiSelectionBox's SelectedItems property to find out which. Each item can be specified either as a simple string or as `item( ... ) which includes an ( optional ) ID and an (optional) 'selected' flag that specifies the initial selected state ('not selected', i.e. 'false', is default). // All items are simple strings, none has an ID, no item preselected. // Items have IDs, some are preselected. // so you may or may not explicitly specify that. // Retrieve the list of selected items and output it. // i.e. before it is destroyed! 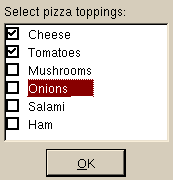 // Concatenate the list of selected toppings to one multi-line string. // Open a new dialog to echo the selection.